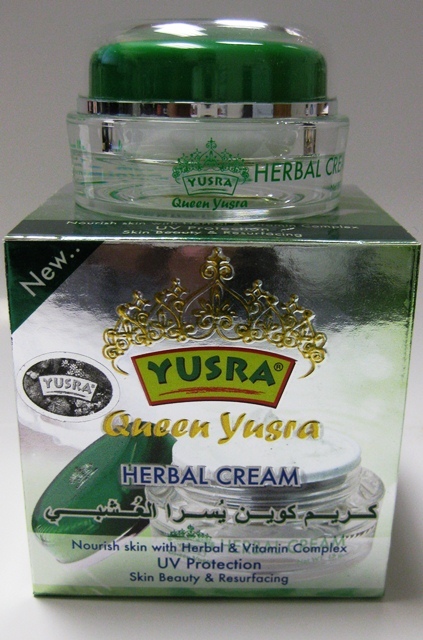 Queen Yusra herbal cream created for enhancing your skin’s elasticity, lightening your skin and protect from harmful UV rays. It is effective against prematurely aged. Special formulation natural herbal extract & vitamins complex are a double action to promote the skin whiteness and keep your skin’s natural moisture. Direction: Rinse your skin with warm water and wipe it out. Apply the cream and massage it intensive. Use regularly 2 times daily morning and night. Ingredients: Aqua, Cetearyl, Alcohol, Glyceryl Stearate, Ceteareth-20, Ginseng Extract, Aloe Barbadensis, Isononylisononanoate, Butylene Glycol, Glycerin, Sodium Lactate, Titanium Dioxide, Methylparaben, Propylparaben, Green Tea Extract, Green Tea Leaf.